Resurrection Mausoleum in Justice, IL. Photo by author. Resurrection Cemetery in Justice, Illinois, is famous for Resurrection Mary, the hitch-hiking ghost of a young woman said to have caught a few rides home from a former dance hall down Archer Road. She supposedly still lingers at the cemetery’s main gate. But don’t go to Resurrection just to catch sight of a ghost. 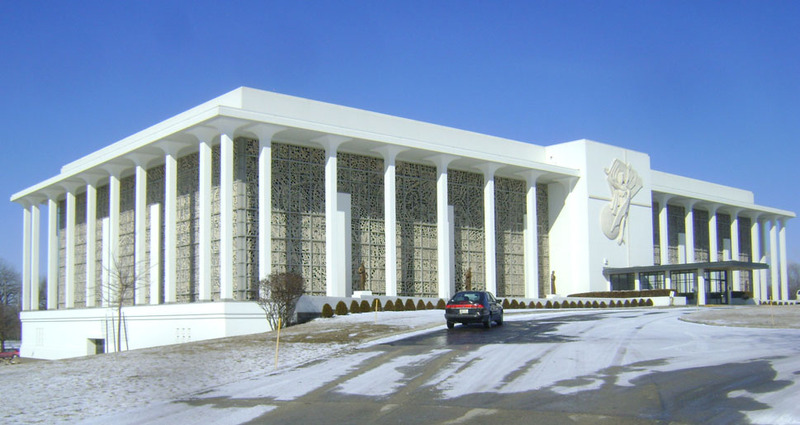 The 1969 Resurrection Cemetery Mausoleum is a modern architectural tour-de-force in the southwest suburbs. Harley, Ellington, Cowin, & Stirton of Detroit, Michigan, were the architects. The firm, known today as Harley Ellis Devereaux, is still in business with additional offices in Chicago and Los Angeles. 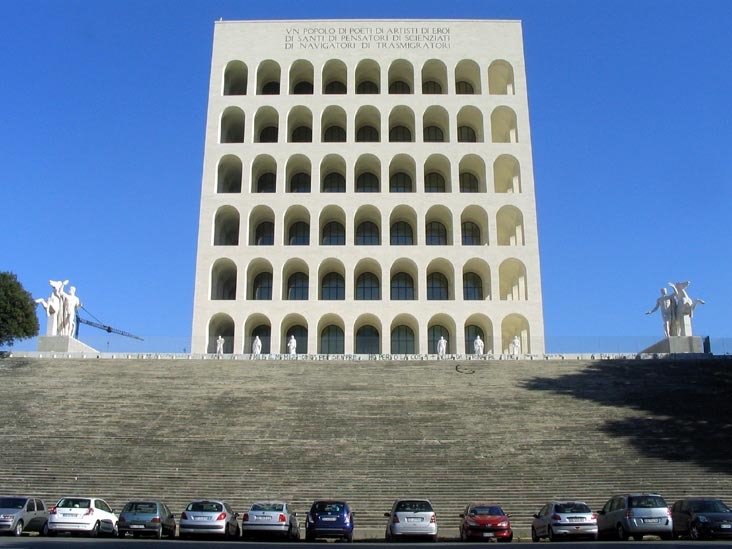 The mausoleum was designed in a mid-century classical style known as New Formalism. New Formalism is on the long road of Greek and Roman revivals. 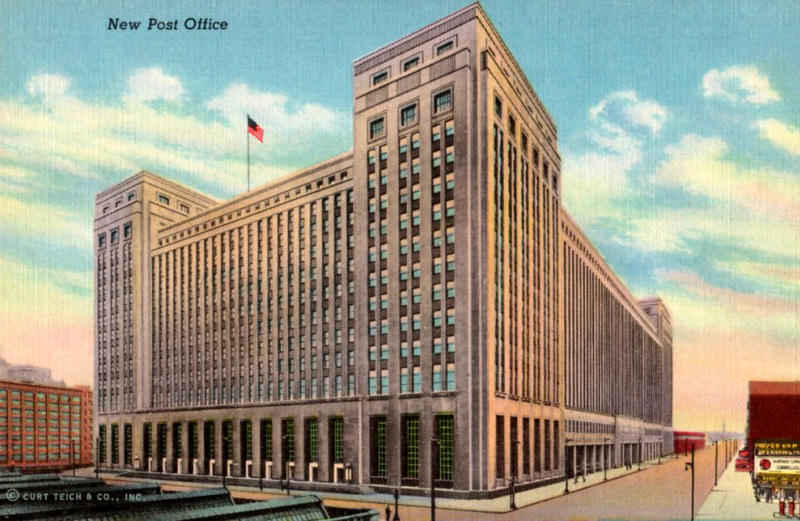 Before World War II these were represented by the Italian stile littorio architecture (exemplified by Rome’s Palazzo della Civiltà Italiana) and “Stripped Classicism,” an off-shoot of Art Deco that manifested itself in much of the work of Graham, Anderson, Probst & White, such as the Merchandise Mart and the Old Main Post Office. 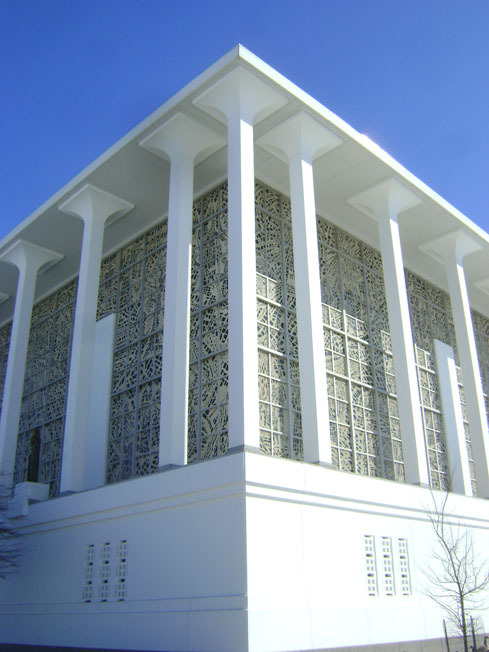 Edward Durrell Stone, Minoru Yamasaki and others popularized the style, which was used frequently to add gravitas to government, institutional, and financial buildings. Notable examples include Avery Fisher Hall at Lincoln Center (Max Abramovitz, New York, 1962), Stone’s John F. Kennedy Center for the Performing Arts (Washington, D.C. 1971) and Yamasaki’s Michigan State Medical Society Building (East Lansing, Michigan, 1959). Before the mausoleum was constructed, Harley, Ellington, Cowin, & Stirton had used New Formalism for their State Department Extension (Washington D.C., 1966 in a joint venture with Graham, Anderson, Probst and White) and the South Wing Addition to the Detroit Institute of Arts (Detroit, MI, 1966). Detail of stripped classical columns that surround the exterior. Photo by author. Like the Kennedy Center, Resurrection Mausoleum recalls the form of a classic Greek temple rendered in bright white concrete. The building is situated on a rise in the land adjacent to a small lake and surrounded by trim green lawns. The lowest floor forms a solid base serving as a platform for a colonnade of crisp white columns wrapping around all four sides and rising two stories. The slender square columns flare out at the top to support the thin, taut slab of the porch roof. 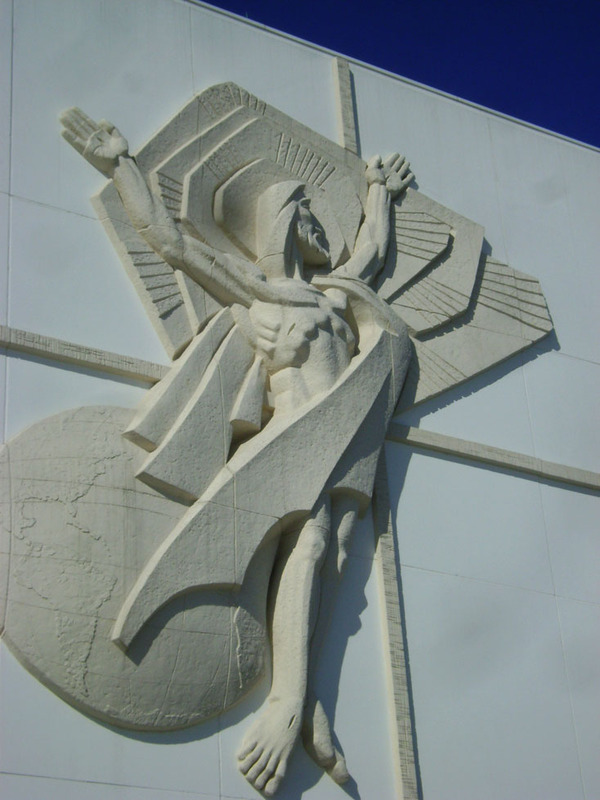 The warm bas relief sculpture of Christ Risen over the main entrance contrasts with the stark white walls. Photo by author. At the east-facing main façade the land rises up to the level of the colonnade. The entrance itself is marked by a solid volume projecting past the colonnade that displays a large low relief sculpture of Jesus Rising. The pale beige of the sculpture contrasts with the stark white wall behind. A long black entry canopy leads to the front door below. The inner temple volume behind the colonnade has walls composed almost entirely of dalle de verre stained glass, containing 2,248 individual panels. Dalle de Verre, also known as faceted glass and introduced to the United State in 1955, is created from thick pieces of colored glass set in a matrix of mortar. Gabriel P. Cartwright of the Conrad Pickel Studios was the designer. 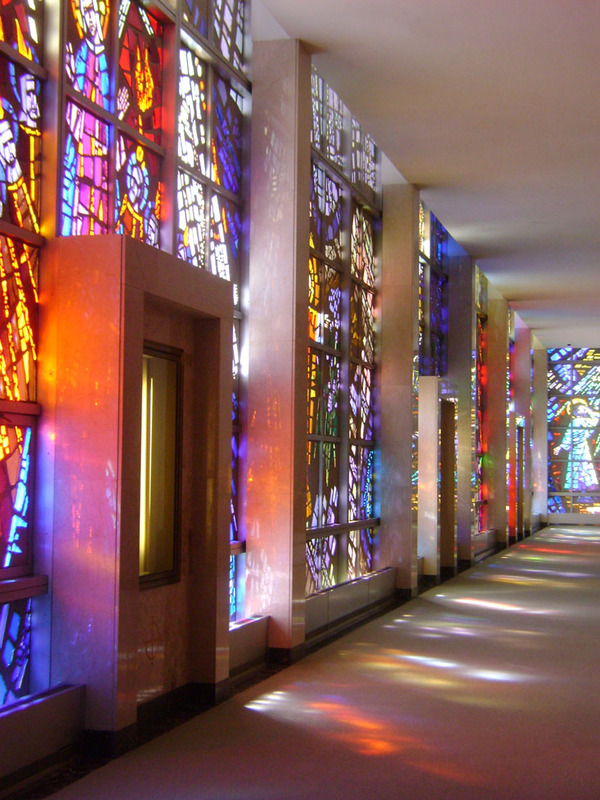 According to the Guiness Book of World Records the stained glass walls at the Resurrection Cemetery Mausoleum, at 22,381 sq feet, are the largest glass installation in the world. The world's largest installation of dalle de verre lights the interior in a kaleidoscope of color. Photo by author. The atmospheric interiors of the second and third floor “Chapel” and “Shine” levels are dominated by these window-walls. The glass glows with brilliant reds, greens, oranges and blues, casting kaleidoscopic light on the walls, floor and elegant retro furniture. Stories from the life of Jesus, the saints and the bible are depicted with a dramatic flare: the Pharaoh cracks a whip that coils around his body; Christ stands at the prow of a ship on a stormy sea; and a lion menacing Christian martyrs has fangs and claws dripping with blood. 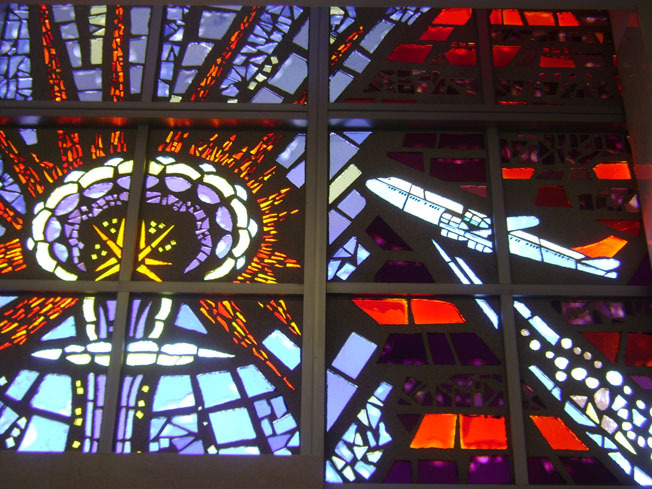 Atomic explosions and jet planes figure into the imagery of Resurrection's stained glass walls. Photo by author. The dalle de verre also contains some unexpected scenes. Dinosaurs roam in the Garden of Eden, and on the north wall one can find jet airplanes, a city of skyscrapers, the Chicago “el,” a radio antenna, a satellite dish and an atomic explosion. A Saturn V rocket launches into space, making this the only reference to NASA in stained glass I know of other than the Space Window at the National Cathedral in Washington, D.C. On the Terrace Level, the mausoleum itself is shown in a painted glass window. The dalle de verre is the big draw here, but there are other noteworthy features on the interior, which is a treasure trove of work by Polish artists and artisans. Many reference Polish heritage, such as the painted tile installations of famous Churches with connections to Poland or to Saints important to the Polish people. Sgraffito panels by Josef Slawinski are boldly colored. Photo by author. 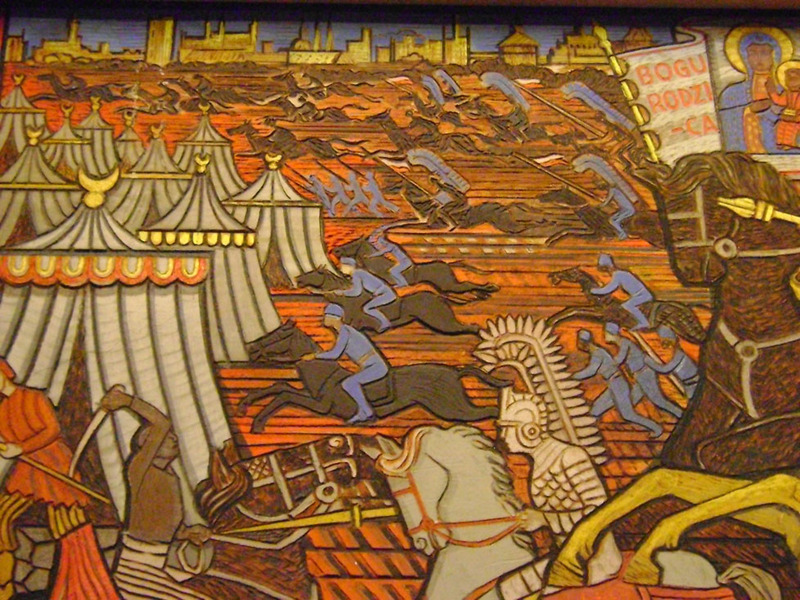 My favorite work in the Mausoleum is the sandy textured sgraffito panel by Józef Sławiński (1905-1983) showing a cavalry charge with horses and men streaming across the background behind camp tents and clusters of warriors in the foreground. Sgraffito is an ancient subtractive technique where multiple colors of cement or plaster are applied in layers. The medium is carved while still wet to produce an image. Slawinski’s panels have similar richly pigmented color blocks and flattened space as woodcut prints. 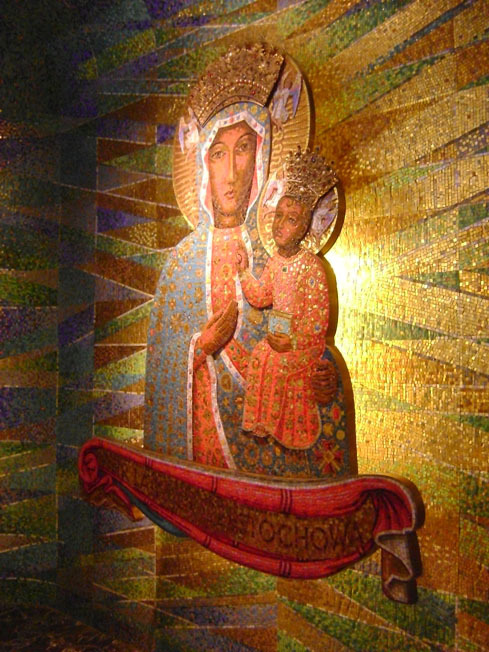 The tile mosaic of Our Lady of Czestochowa in the Terrace Level chapel sparkles. Photo by author. Murals by local Chicago artist Melville P. Stienfels (1911-1997) also have a flat aesthetic and show vignettes of Polish heroes, such as Marie Curie researching radioactivity in a lab. Stienfels also designed the sparkling two-layer mosaic of The Black Madonna of Częstochowa behind the altar of the small Our Lady of Czestochowa chapel on the lower Terrace Level. In a May 10, 1976 article, the Chicago Tribune notes the 14 eight-foot tall stoic marble saints standing watch over quiet corridors on the Terrace Level. The statues were carved by Ferdinand Rebechini (1923-2003) of Rebechini Studios Inc., Elk Grove, IL. He also designed the statue of Father Marquette, Louis Joliet, and their Indian guide at the Chicago Portage National Historic Site. Rebechini’s most famous work is the 30-foot tall granite Christ the Teacher in nearby Queen of Heaven Cemetery in Hillside, IL. Like at Resurrection, the cemetery’s 1956 mausoleum was designed by Harley, Ellington, Cowin, & Stirton. The firm took a very different design approach with the earlier mausoleum, a Gothic building with rustic stone walls and a central tower bristling with spires. Once you walk through the front door, though, many similarities with Resurrection become apparent. The Queen of Heaven Mausoleum has an interior of dalle de verre, sculpture, retro furniture and fantastic contemporary art. Thanks for your wonderful research and descriptions of these mid-century gems. This is a great site! Thanks for drawing attention to this gem. Sadly, many of my coreligionist Roman Catholics do not appreciate Modernism these days, with some theorists going so far as to denounce examples such as this as being antithetical to Catholic faith and culture. It’s refreshing and significant to read a respectful appreciation like this. Thanks for the article Chris. Our firm (Harley Ellis Devereaux) was one of the leading designers of Mausoleums in the Nation during, and for quite some time after, that period. Our “Christ the King Garden Crypt Mausoleum” at Queen of Heaven Cemetery was another more contemporary but equally dramatic design expression. Nice to see our work still creates conversation. Denis King, FAIA, Corporate Operations. We are happy to showcase fantastic mid-century projects like the work of your firm at Resurrection Mausoleum. It’s such an incredible building and the craftmanship of the interior artwork is amazing. Perhaps I can convince Nate to take a look at the Christ the King Mausoleum at Queen of Heaven for a future post! Resurrection Cemetery Mausoleum was quite an amazing place to stumble upon. I came across it with a friend very unexpectedly while exploring the Southwest suburbs. I am interested to hear your firm did multiple mausoleums – I would love to see more. I am already planning a trip to Queen of Heaven….are there others around Chicago? Harley Ellington Pierce Yee Associates designed All Saint’s Cemetery in Des Plaines (at N River and E Central) in 1972. I think it’s even more startlingly modern than Resurrection and similarly filled with modern religious art. Thanks for this wonderful article, Nate.